With the race to 2020 beginning in earnest, Trump should take a page out of his vice president's Asia playbook: Do no harm. If President Donald Trump is worried about Mike Pence upstaging him in 2020, he has no one to blame but himself. As Trump rankles allies and foes alike with his support of Saudi Arabia, the vice president is proving himself to be a savvier — or at least more settled — diplomat on the world stage. In a recent trip across Asia, Pence may not have offset the president’s stated “America first” view. Still, the vice president, largely a cipher for much of Trump’s term thus far, evoked less of the bitterness and frustration that has followed his boss’s forays abroad. At the very least, while reiterating Trump's critiques of China, Pence consistently conveyed the message that Asia remains very much America’s backyard — and that some in this administration still recognize this and remain deeply commitment to the region. There was no doubt that Trump’s absence from the Association of Southeast Asia (ASEAN) summit in Singapore and the Asia-Pacific Economic Cooperation (APEC) session that followed in Papua New Guinea were distinctly lost opportunities for the president. But Pence seemed to make an effort to minimize as much as possible just such a loss. While reiterating Trump critiques of China, Pence consistently conveyed the message that Asia remains very much America’s backyard. Often, just showing up is half the battle — as Trump himself realized, to his apparent chagrin, when he failed to appear at the American cemetery on the World War I battlefields of France. Indeed, Trump’s French trip was a disaster — when he wasn’t insulting veterans with his absence, he was offending world leaders explicitly with pointed tweets and reports of sulking. In sharp contrast to the pictures of French President Emmanuel Macron and German Chancellor Angela Merkel, Trump appeared sour, uncooperative and all too willing to slap a hand outstretched in friendship. And yet, wherever Pence goes, he meets and at least tries to ingratiate himself with just about everyone. From the ASEAN summit, where heads of state from Japan’s Prime Minister Shinzo Abe to China’s President Xi Jinping and Russian President Vladimir Putin made their voices heard, to Papua New Guinea and the APEC summit, Pence, on his third swing through the region in three years made an effort — at times even a successful one — to meet and greet America’s friends and adversaries alike. While not as explicit as a Trump tweet, Pence’s message was clear: America is committed to the success of the region. At his first stop in Tokyo, Pence kicked off a joint press conference with Japan by praising the “firm” alliance between the two powers as a “model” for other Asian nations and beyond. “Our nations’ security and prosperity depend on this vital region, and the U.S. will continue ensure that all nations, large and small, can thrive and prosper,” Pence said, adding a Trump talking point that putting pressure in North Korea was still necessary to maintain the Korean peninsula a nuclear-free zone. Onward to Singapore and the ASEAN summit, where both Xi and Putin took top billing with Trump out of the picture. Pence’s goal here, particularly, was to persuade a host of Asian nations large and small that tying their future to the American model, especially in trade and development, was far preferable to tying themselves to the competing Chinese system known as "One Belt, One Road." 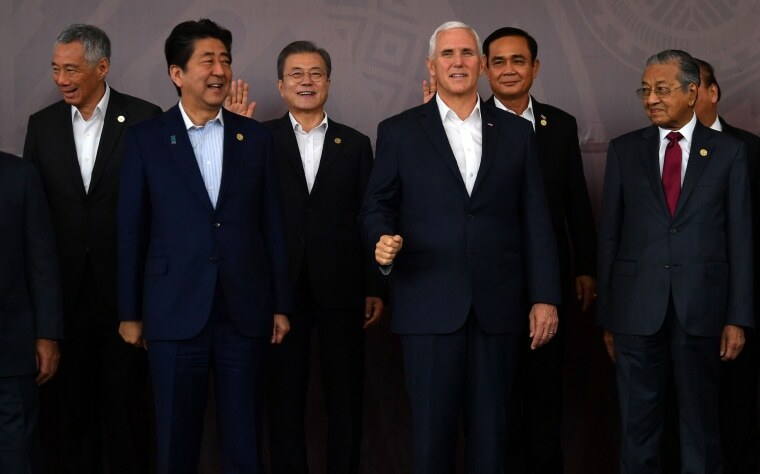 Indeed, with a dour John Bolton glaring silently over his shoulder, Pence told the ASEAN leaders that “we seek an Indo-Pacific in which all nations, large and small, can prosper and thrive — secure in our sovereignty, confident in our values, and growing stronger together.” Then, in a direct swipe at Beijing, Pence added, “We all agree that empire and aggression have no place in the Indo-Pacific.” The question, of course, is who this “we” might be. Pence — and Trump — would be wise to up their diplomatic game. Many of these ASEAN members are already beginning to hedge their bets. The finance minister of one of these smaller nations told me earlier this year that his country was already starting to do deals with China it would never have contemplated less than a decade ago. While Beijing’s "One Belt, One Road" trade and development initiative debuted around the time talks over the Obama-promoted Trans Pacific Partnership (TPP) trade pact were intensifying, lately China has had some success portraying the pact as a means of filling the vacuum left by Trump’s withdrawal from TPP early on in his presidency. Instead of the TPP, Trump has proposed a series of bi-lateral trade agreements across the region. So far, however, only a South Korean accord has been reached, and pacts with Japan, Vietnam and the Philippines remain on a distant horizon. Beyond that are such nations as Brunei, Malaysia and Singapore that have been left out in the cold with the end of the TPP. Now, all of these countries — plus Australia, Canada, Mexico — and Japan are moving forward with their own answer: a mouthful agreement called the Comprehensive and Progressive Agreement for Trans-Pacific Partnership. This was the atmosphere into which Pence parachuted, seeking to calm very roiled waters and America’s increasingly skeptical allies. At the same time, he was clearly prepared to toe the Trump line in public, at least with respect to the trade war that the president continues to press. Again, Pence didn’t always succeed. Still, the vice president did succinctly outline the priorities of the bi-lateral talks Trump and Xi are scheduled to hold at the G-20 summit in Argentina. The administration may be seeking a way to avoid a threatened new round of $267 billion of tariffs if talks fail again. Perhaps most telling was Pence’s disclosure that he’d spoken twice, privately, to Xi. “I know he is looking forward to his meeting with President Trump,” Pence told reporters. Above all, he told Xi that Americans want a better relationship with China, “but there has to be a change… trade practices, tariffs and quotas, forced technology transfers, the theft of intellectual property. It goes beyond that to freedom of navigation in the seas, concerns about human rights.” In other words, all of this is on the table for the next Xi-Trump face-to-face meet. If Trump is hoping for success at the upcoming G-20, as well as in his several bi-lateral sessions and beyond, he should perhaps take a leaf out of Mike Pence’s Asia playbook: Do no harm.